For those who live in a small apartment that's devoid of a proper linen closet, you'll have to find a means of storing all of your towels and toiletries in your cramped bathroom. Luckily, there are some compact bathroom accessories that can keep your linens in order when they're not in use and within arm's reach of your shower when you need them, according to Better Homes and Gardens. A bathroom vanity with internal storage is a quick and easy way to give your bathroom a face lift and de-clutter your space. You can also use side cabinets next to your vanity to keep towels, toiletries and any other personal items out of view. Instead of using a towel rack that can take up a ton of wall space, consider hanging a few hooks on the wall next to your shower. Go with a style that matches the hardware above your sink to create a streamlined arrangement. Now you'll be able to hold multiple towels on a single wall and improve the utility of your space. Storage is always at a premium in an urban apartment, but these tips will help you to remove some of the junk that's been cluttering up your space. 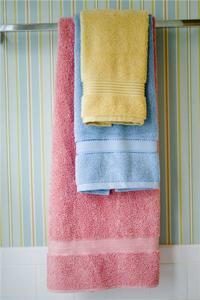 What bathroom storage tips do you have for first-time apartment dwellers?